The Saturday morning test session at the Roar Before the 24 was cut short when the #50 Highway to Help Riley-Dinan Daytona Prototype flipped into the catch fence and onto its roof in Turn 1. Byron DeFoor was driving as it suddenly spun, caught air and went into the catch fence, landing upside down. According to Sportscar365, a Continental Tire spokesperson noted that a tie rod or suspension failure on the left side of the car is to blame. Fortunately, infield medical center staff have already evaluated and released DeFoor. Despite the car giving DeFoor the biggest Code Brown of the new year, all of the safety items on the car did their job. David Hinton, Jim Pace and Dorsey Schroeder are sharing the car with DeFoor this weekend. 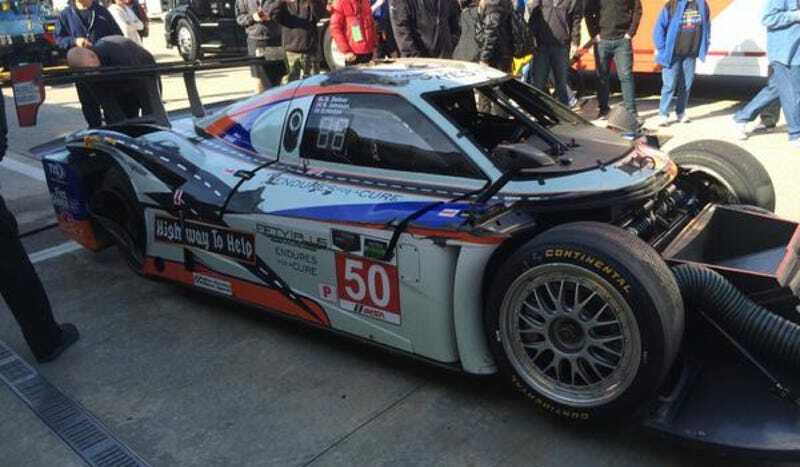 The Rolex 24 at Daytona will be Schroeder's first race since the 1990s.